Based on everything I said in Part I of this series, I suspect that most of you can anticipate where this post is heading reasonably well. If our corporate-owned mainstream news media "rigged" the Democratic primary for Hillary Clinton, they "rigged" the Republican primary for Donald Trump too. There are admittedly some complicating factors here that make the story of the 2016 Republican primary a bit less clear than the case we previously considered; however, as long as we again understand "rigging" in this context as undue influence, I think this is likely the case. In the case of the Democratic primary, we now know that the Democratic National Convention (DNC), a group that is supposed to be neutral throughout the nominating process, was not in fact neutral during the 2016 primary. They were pushing Clinton, and there may have been some collusion with some in the news media to do so. This does not appear to be the case with the Republican National Convention (RNC). In fact, if the RNC was not neutral throughout the nominating process, it seemed that they were probably more likely to be working against Trump. As interesting as this possibility may be, it is not the primary complicating factor I'm thinking of. For that, we merely need to consider Trump himself. Trump may not be a genius in terms of policy or business, but he does seem to be truly gifted when it comes to the art of self-promotion. He has eagerly manipulated the news media in ways that would not have occurred to most other candidates. I suspect that he had a far greater role in creating and maintaining the massive advantage he enjoyed in media coverage throughout the primary than Clinton or her campaign did. If you recall the early days of the Republican primary before Trump announced his candidacy, Jeb Bush was viewed as one of the stronger candidates. He had the name, the money, the connections, and so on. Of course, the name proved to be both an advantage and a disadvantage. It meant that he carried much of the same sort of baggage that Clinton had, just to a lesser degree. But many in our news media were willing to overlook this initially; they seemed to be delighted at the prospect of another Bush v. Clinton story. I watched Trump's announcement...twice. It was fantastic! In fact, I can confidently say that it was the second greatest political speech I have seen in the 10 years I've been writing Atheist Revolution (you can see the greatest political speech here). I even tuned into a couple of cable news channels I have not had on in more than two years just to see how they would cover it. One knows what one is getting with Trump; there is very little mystery to it. Is he serious, or is this performance art of some sort? This was our first taste of Trump's over-the-top approach to self-promotion, and our news media ate it up. And really, who could blame them? Well, that's the thing. We should all blame them the moment they abandoned any pretense of covering all the candidates equitably. From the moment Trump entered the race, he was the story. His campaign would benefit from an overwhelming advantage in terms of the amount of media coverage he received. Even though nobody initially regarded him as the "presumptive nominee" or as being as "inevitable" as Clinton, they could not stop talking about him. Trump dominated the news and ended up seeming far more viable than he would have otherwise. The brilliance of Trump during the primary was his recognition that it did not particularly matter whether the media coverage of his campaign was positive or negative. When it was positive, he gloated and insulted the other candidates. When it was negative, it fueled his narrative about how the RNC and the media were out to get him because he was a threat to their power. His base at it up. All that mattered was that he stayed in the news while his competitors were largely forgotten. And when some cable TV shows actually allowed him to phone in his interviews, it became clear that he was being treated differently than the other candidates. As Trump's poll numbers soared due to his unbelievable advantage in airtime, he was positioned perfectly for the Republican debates. 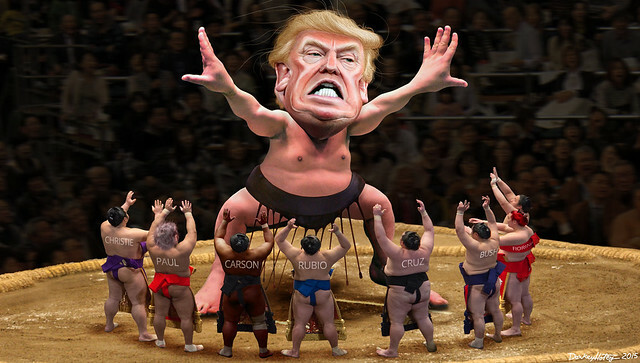 Remember the imposing figure of Trump in the center of the stage? By this point, he really did not have to debate at all. As long as he would continue to make outrageous statements between debates, he would be the lead story, his poll numbers would continue to rise, and he could essentially focus his efforts on tearing down his competition. Jeb Bush did not stand a chance. Throughout the Republican primary process, Trump made sure that he remained the top story. We heard so much more about him from our news media compared to any other Republican candidate. As a result, he stuck in our consciousness in a way they would not. Unlike the "first female president" narrative being pushed by many in the media on Clinton's behalf, there was not a clear and unambiguous pro-Trump narrative during the Republican primary. There was, however, a not-so-subtle admiration of his success. "Look at how well he's doing in the polls. There must be something here." And just like Clinton, Trump would benefit from the massive advantage in coverage compared to his competitors. Given the number of Republican candidates in the race at the time of the debates, there was probably little choice other than to do what was done and include candidates in the debates based on their poll numbers. Trying to include all the Republican candidates in one debate would have been a challenge. But because the media's coverage of the candidates had been so horribly uneven, there was no way those who had consistently been ignored could be expected to poll any better than they polled. Candidates were being weeded out of the process by the lack of airtime they received. When pundits claimed that they needed to spend more time on the candidates who were polling better, they never acknowledged their role in why some candidates were polling better than others. Mr. [insert name of candidate], your opponent, [insert name of competing candidate], recently said [insert random insult]. Would you like to respond? These debates were not about policy or outlining one's vision for our nation; they were about trading petty insults that could be turned into sound bytes. This put some of the candidates at a real disadvantage, but it played right into Trump's hands. Given such an opportunity, he bullied the low-energy Jeb Bush right out of the race. Unlike the Democratic primary where it looked like many in the news media were in the bag for Clinton at the outset, things were less clear in the Republican primary. And yet, there is no question that Trump's campaign benefited from his massive advantage in coverage relative to the other candidates. Once again, we see an example of how our mainstream news media influences elections by deciding who to cover and who not to cover. Both Clinton and Trump had significant and unfair advantages during their primaries. Unless we are content with our news media influencing our elections in this manner, I think we have to get serious about not allowing this to happen in the future. In Part III of this series, I'll take a look at an election that has not happened yet but is currently in progress: the 2016 general election.